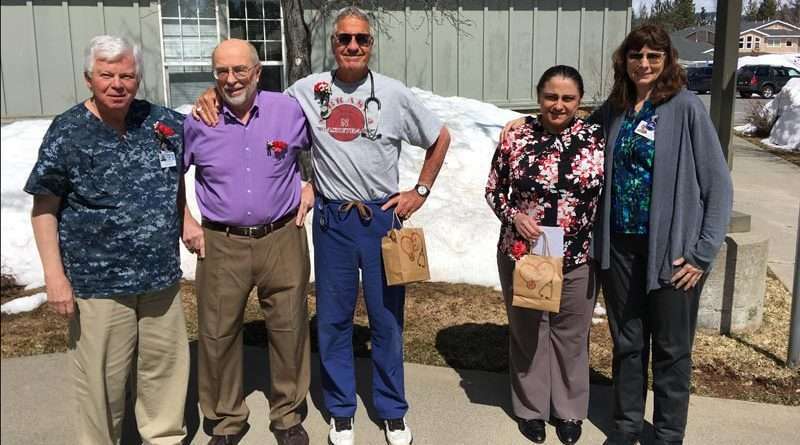 Some arm-twisting is always required, but these Seneca doctors are still all smiles as they pose just long enough to snap a photo with CEO Linda Wagner. From left: Stephen Hayden, NP; David Walls, DO; David Dempsey, MD; Niloufar Salehi, DO; and CEO Wagner. Other doctors being recognized at the event, but unavailable for the photo, include Dana Ware, Steen Jensen and Theresa Nielsen. For those who didn’t already know, March 30 is the day set-aside by congress as National Doctors Day. This holiday was first celebrated March 30, 1933, when the wife of a prominent doctor in Winder, Georgia, wanted to create a day just for recognizing and honoring doctors. The idea drew much support and expanded to numerous other areas of the country and was celebrated “unofficially” for 58 years, until in 1991 the United States Congress, by proclamation, officially declared it a national holiday. This year, March 30 fell on a Saturday so medical staff — administration and volunteers from Seneca Hospital —organized a celebration and recognition for SHD doctors March 29. 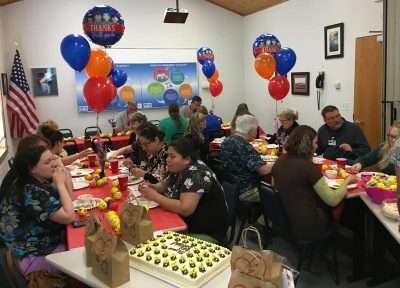 A sumptuous pot luck lunch with smoked tri-tip from Lake Almanor Elks Lodge 2626 was laid out in the Seneca conference room along with a thank you cake and gift bags with tokens of appreciation for the doctors. Because patients take priority at the hospital not everyone could gather together at the same time, but a vast majority of the staff was able to join in as they had time available. March 28 was the monthly meeting of the Seneca Healthcare District board of directors. During the session, the board approved a contract for an upgrade and revamp of the hospital telephone system in order to make it more user friendly for patients as well as staff. The contract to CSI Communications is for just over $85,900. During department reports it was announced that three Seneca staff members had recently completed the Applied Suicide Intervention Skills Training workshop offered in Chester. This is just a small part of the in-depth study course. Additional useful information discussed during the meeting related to possible billing discrepancies. Because of the sheer volume and complexity of the billings due to state and insurance mandates, in-house employees do not handle the vast majority of Seneca billings. Most invoices and statements are developed and sent out by the Healthcare Resource Group (HRG). The coding system alone can account for a myriad of miscues and confusion let alone the chance of human error (typos) with the massive amount of information required. The intent here is to remind everyone there is no need to get angry if you have a discrepancy about a medical bill. In case you haven’t seen it on your invoice, here is a local phone number you can call, explain your situation and have the hospital contact HRG regarding your bill. The number to reach the Seneca Financial Assistance Coordinator is 259-3591.